This July I travelled to three Celtic sites; Lindisfarne, Iona and Kildare. This writing is about my pilgrimage journey. I have learned to love the word ponder. To ponder means……”to think about, contemplate, review…” For me it has meant the unpacking of an experience over time, realizing there are endless treasures if one sits longs enough and waits. Sometimes it is like the experience itself is only a seed that enters the heart. If one is attentive to this seed, one witnesses an expansion and growth into something beyond the original moment. I think of the story of Mary and how the angels came to her and it says that she ‘pondered’. I’m sure she pondered her whole life about those early years and as time went by she could look back in wonder and see things in reflection with new understanding and appreciation. This is how I feel about my pilgrimage trip this summer. And that the simple reflections I share now will be shallow and incomplete. However, talk to me in 20 years and I will really be able to tell you about this trip! I feel limited in what I will write because I have only the understanding of the present moment. But as many of you have been asking questions and wondering what happened, I will share in my limited way as I know it was a life-changing experience for me. I just don’t yet know in all the ways the changes will impact me and you. And what does it mean to be on pilgrimage? I had no idea…but there were moments I found out. I didn’t know I carried a longing! But I realized as I went to each place, there was a bit of an ache in my heart…for connection, for experience, for the ‘aha’ moments to bring new ideas, thoughts, epiphanies. And I realized that pilgrimage is letting go of what you thought the journey would bring…and saying yes to how each day unfolded. It is quite something to walk with a small backpack on one’s back with a few clothes, a journal and one pair of shoes. Dependent on trains, planes, taxis, buses and ferries to get me from one place to another. Dependent on air bnb’s, hotels, community centres for lodging….dealing with a world of people I do not know…and entering a landscape I have never been. I felt stripped of what was familiar to me and my familiar ways of navigating the world in my Toyota Matrix. Sleeping in a different bed every other night and rubbing shoulders with strangers and new horizons created an awareness of the mystery of each day. At the beginning of each morning I would write the date at the top of my journal and realize I had no idea how the day would unfold. What new sights would I see? Who would I encounter? Every day held a place of curiosity and wonder that I realized I can so easily miss back home when I am in routines and places of familiarity. And the first ‘moment’ of encounter happened on Lindisfarne, the Holy Island. There were four landing spots in my journey; three of those were for personal pilgrimage and they were all very far apart from each other. The first stop was in Liverpool where I was met by my friend Gill Nisbet who graduated with me from the Haden Institute this past spring. She welcomed me to England with her beautiful family and then she and two of her kids drove me up in their landcruiser all the way up to my first pilgrimage site off of the north-east coast of England; Lindisfarne, The Holy Island. To get to Lindisfarne we had to drive over a causeway, a section of road that is only open when the tide is low. It is kind of wild to cross over this passage knowing that in a few hours time the road will be covered with ocean waters. As the tide rolls in, the land becomes surrounded again by ocean waters and is again an ‘island’. 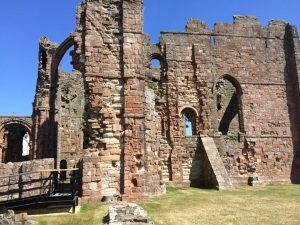 There is a lot of history with Lindisfarne and I stayed there three nights in a lodging hosted by the Open Door Community, an off-shoot of the Northumbria community which has put out a lot of Celtic prayers, books, music, and spiritual teaching for many, many years. On this island are the ruins of a monastery from around 1400 years ago (http://www.english-heritage.org.uk/visit/places/lindisfarne-priory/) led first of all by St. Aiden and then years later by St. Cuthbert. There are numerous stories associated with these two men and their influence over the Northumbria area of England lingers to this day. St. Aiden had been sent over to Northumbria from the Iona community in Scotland. It was the time of both Vikings and Saints and there are many stories of Viking raids on the beaches where I sat as well as miraculous stories of healings by the saints that lived here. St. Aiden carried with him the Celtic spirituality from the Iona community and the relics here bear resemblance to what I witnessed on my voyage to Iona a few days later. So, here I was in this landscape that held history and spiritual significance with my simple backpack and on foot. I realized that I carried a longing, but I didn’t even know what that longing was. I ask so many people as they come to retreats or gatherings this question; ‘What is your longing?’ I realized that it is possible to not know what one’s longing is…only that one carries it. That was me. Carrying a longing but not even knowing what it was. And so I carried my longing to the community house – would my longing be met there? The community of Open Door in Lindisfarne was quite dismantled when I arrived. No one there to greet me and when someone did come, I realized the whole organization was going through a great transition and that there was not the living organism of a Celtic spiritual community that I expected. I realized I would have to let go of connecting in the way I had hoped. But I was safe and I could have lodging as I explored. I walked to the ancient church. Would I find the sense of Sacred Presence there? Again, disappointment. I walked to the ruins of the old monastery. Would I find what I was looking for there? It was interesting and fascinating, but did not meet the longing in my heart. So, I walked. I walked and walked and walked. I found the beaches where Saints and Vikings both arrived. 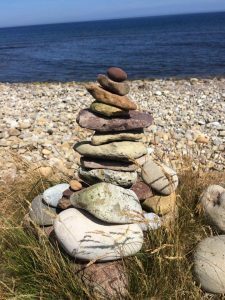 I found piles and piles of stones set upon each other like altars of prayer…places of memory. And so I joined in the memories of others and I built my own. 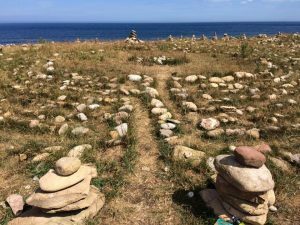 20 stones…for 20 years of memory this summer. 20 years – remembering when things all fell apart for me and I knew such utter pain. 20 years of grace….being met at the bottom by Love. Remembering …remembering. With each stone, I remembered. And I was grateful for how I’ve been guided, how I’ve been healed, how I’ve known grace. And I turned around and there right beside me was a huge stone labyrinth. I couldn’t believe it. I had been sitting right beside it for 2 hours and hadn’t even known!! And so I walked the labyrinth on the edge of the island with the breeze in my hair and remembered. And as I held the stones, as I walked the labyrinth, as I felt the breeze, as I gazed upon the waters…..I knew the Mystery of Presence with me. All was well. I did not find You there. And so I went to the edge of the shore in silence. And we became silent together. And she said I had written it like it was just for her. And she asked if I’d read it again. And so I ended up reading it three times and we entered a very, very gentle and quiet space between us. And she then said, “I came here to have this moment here with you.” Tears came to my eyes and we entered silence together. And then she hugged me and called me, ‘precious’. And my heart was overwhelmed with all that transpired…my own struggle to find connection, being present to another’s struggle and meeting them in it, knowing another moment of grace as I witnessed a face become tender with receiving the very thing they need. Weeks later after I returned home I received a post-card in the mail from this woman and it took my breath away. The picture on the card had the same colors and picture as what I had drawn in my journal the day I stood at the fence and knew Presence. And she wrote on the back…… “And God met me…you met me”. And I cried. How does one explain such things? I was learning about pilgrimage. Pilgrimage is to step into unknown places with simple belongings…..and to let go of what I thought I might experience…and say yes to the unexpected and surprising. Pilgrimage was about being present to each moment and allowing whatever needed to unfold to do so. Pilgrimage was about noticing what was right in front of me and encountering beauty. Pilgrimage is about being vulnerable….not always feeling satisfied…but walking and asking questions. And so as I embraced my new friend that day after reading my poem, she helped me take my things out to the taxi. My quest was leading me on to Iona.